Married in 1979. Three children. Sold Life Insurance, Worked at Northwest Signal, National Award Winning Business with Princess House for 13 years. Divorced in 2009-2013. Moved to Palmetto FL in 2009. Opened online business in 2010 with my fiance John Lascko. We opened a brick & mortar store in 2011. He passed away in 2013. Moved to Sarasota with my Life Partner Gary Drouin in 2015. Closed my brick & mortar store in 2016 to focus on my growing online business, now a Top Rated Premium Seller Store on eBay shipping worldwide, most recently to Santiago, Chile. Janet Zumfelde has a birthday today. 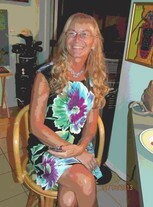 Janet Zumfelde updated her profile. View. Janet Zumfelde added a photo to her profile gallery. Janet Zumfelde changed her profile picture.